The unique new design from Solent Marine, SIMBRO, is the first through bolted, completely modular pontoon system on the market. Mooring fingers and pontoons located at 125mm intervals to allow any orientation and layout. Facility for mooring cleats every 180mm. Unique aluminium bearer design supports the deck and completely protected by neoprene rubber to isolate galvanic corrosion. Large top entry service ducts provided on both sides of the walkways to allow easy provision of services to the berthing areas. Triangular Plastic splays with rubber buttons for anti-slip properties. Specially designed and developed glass fibre reinforced concrete floats providing an exceptional buoyancy level of upto 2.5kn/m² - higher than recommended standards. The SIMBRO system has a standard design life of 25 years, however this can be increased to 35 years if prefered. The steel structured mooring fingers are made to be torsionally very stiff, this ensures excellent stability. As the design is completely modular it eases the complications of location & re-location. The construction of a SIMBRO pontoon system is therefore highly cost-effective and less time consuming to build & install. The modular sections are designed specifically to be transported in an open top container or open top curtain sided trailer, making SIMBRO ideal for export to any European country. SIMBRO is built and designed specifically to meet the Yacht Harbour Associations Code of Practise in the UK. 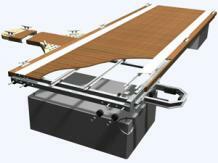 See Simbro Pontoons for more details. Exclusive to Solent Marine, the SOL-DEK composite deck board looks and feels like hardwood & is the perfect compliment to our Simbro system.